Nathmulls Special, Exotic White, Spicy Herbal, all your tea fantasies come true at The Whistling Kettle. And they have the legendary Keventers menu! 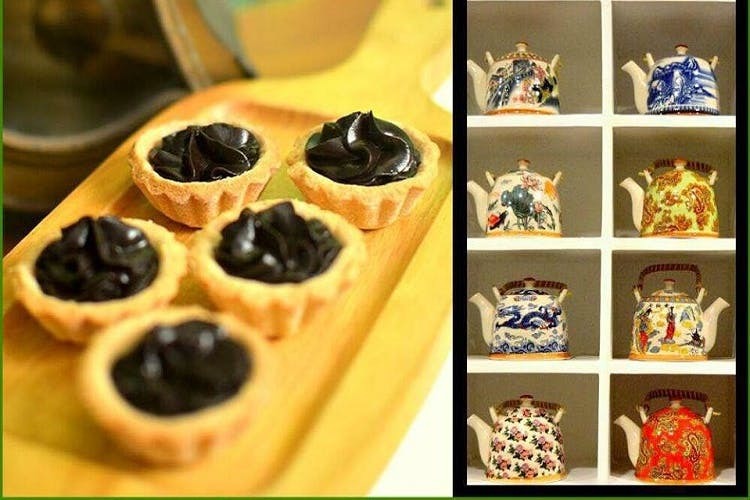 This newly opened tea-room style café and store will give you major Darjeeling feels. Located in Golpark, Whistling Kettle is a wonderful wooden café that’s one-of-a-kind in the city. Walk in to see beautiful crafted tea sets that you can pick up for home. The tea boutique is super-cozy with comfy low sofas and small round tables. If you have been to Darjeeling, you would know about the legendary Nathmull’s tea store on the Chowrasta. They have started this place. So expect some of the best tea the city has to offer. It is sourced from organic tea plantations in Darjeeling. Another reason to head here – they serve that amazing English breakfast platter from Keventers in Darjeeling! Pick a table at the back which has the comfiest seating, and the best view of the small stage area where they host live music sessions a couple of times a week. The tea is served in interesting glasses. We had the lemon ice tea. It was super refreshing. And packed with flavour. The Chicken Platter is a meat-lovers’ dream – ham, sausages and salami, what more could you ask for? The Chicken Jumbo Sandwich and Pepperoni Pizza are perfect for sharing. We loved the all-day breakfast. They also sell self-brewing mugs and lovely tea sets. Perfect to hang out with friends over a a cuppa, or by yourself with a book for company.